Roucou. Sounds very exotic. It is a tree that grows in South and Central America as well as Mexico. It gives red-orange fruit. Its seeds are valuable – dyes and oils is extracted from them. They contain ingredients beneficial for health, often used in hair and facial skin care. Check for yourself why roucou oil is so great! 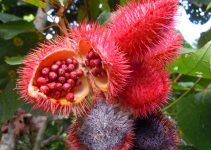 Roucou oil is extracted from the seeds of Achiote (Bixa orellana). Did you know that is is also called the lipstick tree? It has red fruit and pink flowers. One fruit contains even 50 seeds in the shape of heart. They contain beta-carotene, ellagic acid and natural antioxidants. What is more, fruit of this tree are rich in proteins, salicylic acid, sugars and cellulose. They are often used in the treatment of skin and health problems. Moreover, it is a popular dye used for soups, cheese and snacks. It can also replace much more expensive natural colourant – saffron. How does roucou oil influence the condition of hair? Roucou oil contains natural sunscreens, substances eliminating free radical and components preventing from the effects of harmful factors of external environment. It has antiseptic and antibacterial properties. Due to the content of natural dyes, roucou oil enhances natural hair colour and natural highlights. Furthermore, moisturising substances present in the oil help to maintain proper level of water in the skin and hair. What is more, the product ensures gloss, facilitates combing and speeds up the process of drying. Thanks to using this cosmetic, you will be able to say goodbye to tangles once and for all. 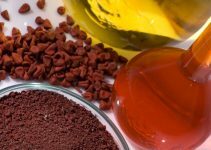 Will the annatto powder help your hair? Of course, it will. 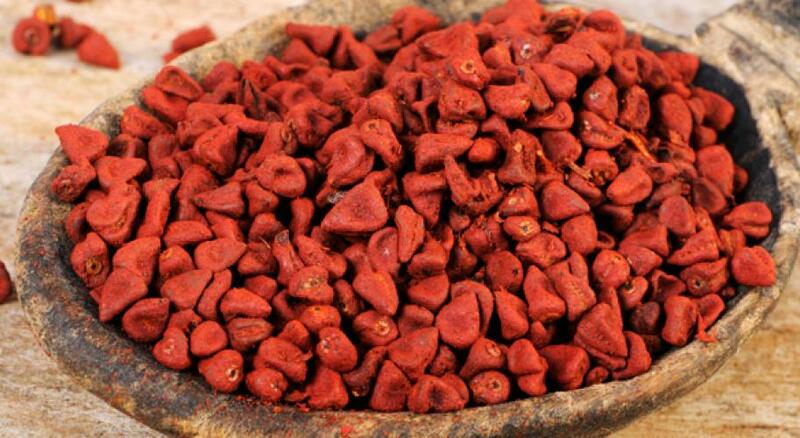 Annatto is a natural dye in the form of an orange or red powder. It is obtained from the seeds of Achiote (Bixa orellana). How does it work and hoe to use it? 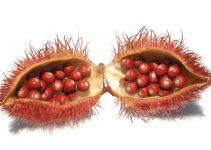 Annatto is very useful for colds, has antioxidant properties and protects the body from harmful effects of sun radiation. It can be used both internally and externally; it is broadly used in cosmetic industries and catering. Moreover, it has a faint but pleasant taste and smell. It is used for colouring many cosmetics and medicine. Annatto powder is very safe and effective. How to prepare oil from the seeds of Achiote? To prepare your own roucou oil you will need a handful of fruit and about 250 ml of olive oil. Heat up olive oil in a small saucepan, then, add pieces of fruit. Boil for 5 minutes, constantly stirring. During this time, the mixture should gain red-orange colour. Next, take the saucepan off heat and leave it aside to cool down. Pour the content into a bottle of dark glass and store in a dry, dark place. How to use roucou oil? One of the biggest benefits of roucou oil is that it can be used as often as you want. The best solution is to use the product before washing your hair. Apply a small amount over your hair; do not forget about the ends. After about an hour, wash it off with a gentle shampoo. Allow your hair to air-dry. Next, gently comb through your strands and style as usual.